Not sure if you are going to need a drill or an impact driver? 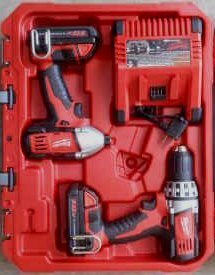 The Milwaukee 2691-22 18v Compact Drill & Impact Driver Combo Kit provides you with the best of both worlds. And it’s also a pretty affordable package, especially considering that these are Lithium Ion powered tools. Both impact drivers and drills have their own specific areas where they shine. Impact drivers are great for situations where you need high torque to quickly drive long screws into hardwood or fasten bolts quickly and securely. Drills are great for drilling pilot holes and driving screws in more lightweight applications. By having both of these tools available, all of your fastening or drilling needs will be covered. Milwaukee is known for heavy duty (and heavy) tools. 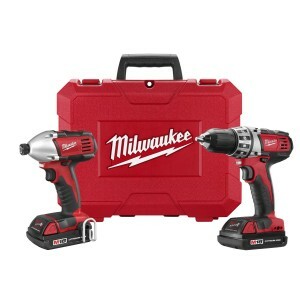 This set gives you the quality, heavy duty feel of Milwaukee tools in a more compact design. These tools are compact, ergonomic and easy to operate. And affordable. All of these are good reasons to want to take a deeper look at what they are capable of. Keep reading to learn more about the powerful specs and amazing battery life that this impact driver and drill kit offers. Looking at many other cordless impact drivers that are on the market at this time, from brands like DeWalt and Makita, this kit from Milwaukee is very cost effective. You get the torque and maneuverability that a compact impact driver offers, and you also get the smooth drilling capabilities of a driver/drill. This gives you plenty of options whether you are looking to drive screws and other fasteners or drill holes in metal, wood and plastic. The price of the Milwaukee 2691-22 combo kit compares to other kits that only include an impact driver alone. For that reason alone this kit from Milwaukee is worth considering, if you are shopping around. Enough about all that though – let’s take a look at the specs and features of the impact driver, and then we’ll look at the drill. What’s In The Milwaukee 2691-22 Combo Kit? You can open the box, spend 30 minutes charging the batteries, and put these tools to use right away. That’s one of the benefits of the Lithium-Ion batteries, they charge quickly. If you’ve been using NiCad battery tools up until now, you’ll notice the difference in battery efficiency. This impact driver is very compact. It has a weight of 3.5 pounds and is 5 3/4 inches in length. This is small enough to reach into tight spaces when needed. What type of power does this impact driver provide? This impact driver has plenty of ability to handle all types of fastening in many types of commercial and home applications. Need to drive a few hundred deck screws? An impact driver such as this will make easy work out of that. What about the other features that this impact driver offers? Both of these features might seem simple, but they come in awfully handy. In dark conditions, the LED light will make it so much easier to see what you are doing. You’ll be able to keep working into the late evening without having to worry about setting up all kinds of lighting to aid in visibility, if the situation calls. The battery life gauge might also seem trivial, but we need to consider how Lithium-Ion batteries work. These types of batteries will run full strength up until the moment they run out of juice, and then they die instantly. There really is no easy way to “feel” if the batteries are low on power, like with older technologies. This way, you will be able to tell exactly how much life the battery still has, without getting surprised when the juice is gone. This is a feature that many other comparable brands don’t offer. You don’t always need an impact driver. For drilling applications, you will also have this compact drill/driver. This drill/driver is also quite compact, it’s bigger than the impact driver but it only weighs 5.3 pounds. What type of power does this drill have? To go along with this power is 24 different clutch settings. The result of this power is a smooth, direct drilling experience. Do you like better control during drilling applications? This drill comes with a side handle to give you better ability to grip it and control it when drilling. If you have been using NiCad batteries up until now, you’ll notice the difference really quickly when you switch to tools that use Lithium-Ion technology. These batteries will hold a charge up to around 4 hours of heavy use, and can be recharged in about 30 minutes. Milwaukee batteries also have a charge gauge, which we mentioned earlier, that can come in handy and keep you from any surprises when the battery juice runs out. Milwaukee also builds their batteries with heavy-duty use in mind. They implement recessed terminals, dual slide clips and over-molded battery housing. Why Buy This Combo Kit? This is a great value in that you get a drill and impact driver for around $200 or less (Amazon has great pricing). These are heavy-duty Milwaukee tools that will last a long time, that’s a good thing. Don’t buy cheap power tools, you will regret it at some point. The Lithium-Ion batteries are amazing. You get the flexibility of having both an impact driver and a drill. This will cover any drilling or fastening application you will tackle. Overall, it’s a great value and a quality kit, another great offering from Milwaukee.